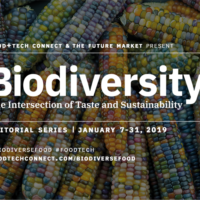 Food+Tech Connect and The Future Market are hosting Biodiversity: The Intersection of Taste & Sustainability, an editorial series featuring interviews with over 45 leading food industry CEOs, executives, farmers, investors and researchers on the role of biodiversity in the food industry. Read all of the interviews here. The future of food is a biodiverse, sitting at the intersection of taste and sustainability. Biodiversity ensures the food industry can delight eaters with new and exciting foods from a diverse set of cultures, while also safeguarding our ecosystems and the genetic diversity required to ensure crops can evolve to better face threats like pests and disease, climate change and extreme weather. 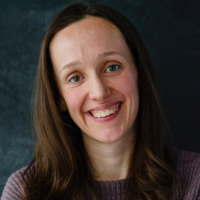 Below, we speak with Shauna Sadowski, Head of Sustainability for the Natural & Organic Operating Unit at General Mills – which includes Annie’s, Cascadian Farm, Muir Glen and Epic – about why biodiversity is critical to the company’s success. Sadowski talks about General Mills’ investment in regenerative agriculture and shares specific strategies and resources for integrating biodiversity into your business. She also provides inside into the companies true cost accounting methods and how they measure their impact. Danielle Gould: Is biodiversity a priority for General Mills Natural Organic Operating Unit? If so, how and why? Shauna Sadowski: Across General Mills, biodiversity is not only a priority, but a requirement for our business to succeed. Natural and organic brands like Annie’s and Cascadian Farm have a long history of supporting organic agriculture, which promotes biodiversity by focusing on practices like biological pest management and crop rotations. Now, we’re further amplifying our commitment to biodiversity by advancing regenerative agriculture practices like extended crop rotations and minimized tillage, both of which help life thrive above and below the soil. Our longstanding partnership with The Xerces Society for Invertebrate Conservation is at the core of our commitment to biodiversity. To date, General Mills has invested over $6 million in pollinator research, capacity building for field biologists, and planting of pollinator habitat both within and beyond farms in our supply chain. With an estimated three quarters of the world’s flowering plants and over one third of our agricultural crops dependent on pollinators, supporting pollinator and wildlife habitat is a high priority for us. DG: How does General Mills Natural Organic Operating Unit define and think about biodiversity? What does an ideal biodiverse food system look like? How do you measure biodiversity, and when will we know when we’ve arrived at a “good” level of biodiversity? SS: We take an outcomes-based approach, recognizing that measuring impact in agriculture is critical to ensure we’re having a positive effect on ecosystems and communities. We frame our understanding of regenerative agriculture around three key outcomes: soil health, above ground biodiversity, and farmer economic resilience. We understand that, like most things, biodiversity plays out differently across diverse regions and farming systems, and the optimal thresholds will differ accordingly. To honor regional variability, we worked with Xerces to incorporate tiered biodiversity indicators into Version 1.0 of our Regenerative Agriculture Scorecard, a user-friendly self-assessment tool for farmers to understand how their practices influence outcomes in soil health, biodiversity, and farmer economic resilience. Now, we’re working with Xerces and other partners to develop an on-farm measurement protocol to quantify biodiversity outcomes on the land. DG: What is General Mills Natural Organic Operating Unit doing or planning to do to promote biodiversity? SS: Since we know our biggest opportunity for impact lies in our own supply chain, our focus on biodiversity is rooted in the actual products we make and the ingredients we source. For example, this year Annie’s partnered with organic farmers in Montana to create two farm-direct products that feature ingredients grown using regenerative practices including cover cropping and diverse crop rotations. To highlight the importance of diversity, we incorporated multiple rotational crops from each farmer’s land into these products—wheat and oats for the bunny grahams, and wheat and peas for the mac and cheese. Without a strong market established for each crop within a diverse rotation, farmers do not have the full set of resources they need to advance extended rotations. We continue to explore sourcing opportunities to support whole farm rotations that promote diversity in plants, soil microbes, wildlife, and other living organisms that help ecosystems thrive. The business case is quite simple: we all eat. Biodiversity on farms is as much about healthy ecosystems as it is about healthy businesses and a healthy food supply. Beyond mitigating economic risk associated with threats like crop disease, pests, and climate shocks, biodiversity benefits effective ecosystem functioning, and in turn, ensures sustained yields over time. As a food company, we rely on the stable availability of agricultural ingredients. Our efforts to foster biodiversity balance the triple bottom line of people, planet, and profit. SS: We hope to see a paradigm shift that emphasizes the protection and regeneration of natural resources on which our food system relies. Assessing the true cost of food production at each step in the supply chain is a good place to start: by accounting for externalities like soil erosion and compromised water quality, which can stem from certain agricultural practices like over-tilling and over-use of chemical inputs, we can begin to internalize those costs. We also believe that a place-based approach is imperative. Landscapes across agricultural regions vary, and supporting biodiversity may look different from place to place. By understanding the agricultural origins of our ingredients, companies can help advance agricultural practices that suit the needs of specific ecosystems and landscapes. SS: Our current food system is built to maximize efficiency, productivity, and specialization. While this has led to a more than doubling of agricultural production since 1960, there are costs associated. Over the last 50 years, human activities have shifted ecosystems more rapidly and significantly than any other time in human history and an estimated 25 percent of species on land will be threatened with extinction by 2050. Prioritizing biodiversity through the food industry requires systems change across supply chain infrastructure, policy, and consumer markets. Beyond partnering with nonprofit groups like Xerces and The Nature Conservancy to protect biodiversity, we’re also working to elevate the importance of supporting diverse whole farm systems by expanding the variety of crops and livestock we purchase. Rather than pulling single ingredients from farms and contributing to a homogeneous agricultural system based on monoculture, we are exploring opportunities to create markets for diverse rotational crops and livestock products that foster above and below ground biodiversity. DG: Does your average consumer care about biodiversity today? Why should they care? How do you (or will you) get them to care? SS: Whether or not our consumers call it biodiversity, there is no doubt they care about this topic. We are fortunate to work with an engaged consumer base that has an appetite for learning and questioning the status quo. We often say that we strive to “do the right thing, even and especially when no one is looking.” We don’t wait for consumer signals to prompt action that will drive positive impact. Rather, we listen to our consumers’ interests and find ways to communicate meaningful impact in a way that resonates with their values. SS: Understanding why biodiversity matters is paramount. Biodiversity affects every step in the food supply chain, and without a solid understanding of the “why”, it will be challenging to foster the engagement needed at all levels. 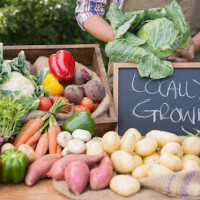 One of the most important efforts retailers, manufacturers and other food systems stakeholders can advance is to enhance visibility all the way back to the farm level of the supply chain. By increasing industry and consumer awareness around where and how our food is grown, we can start to make progress toward supporting practices that promote biodiversity at the farm level. SS: More than 40 percent of our calories globally come from only 3 crops: wheat, maize, and rice. Through creating stronger markets for a wider variety of rotational crops and livestock, and by elevating agricultural products grown in ways that promote biodiversity, ingredients can support impacts beyond productivity and shelf stability. We’re encouraged to see more soil-building crops like buckwheat and spelt showing up on grocery store shelves and in packaged goods—a sign that the food industry is advancing impact beyond short-term volume and efficiency goals. We’re also encouraged by the increasing attention of consumers and food companies alike on where and how food is grown. Connecting the dots between a region’s ecological capacity and the foods grown and raised in that region is critical for us to advance better food systems. Natural resources and biodiversity differ across the globe, and it’s important for us to understand the ecological impacts of the foods we’re growing to ensure we’re not taking more than can be replenished. We’re encouraged to meet farmers who are helping us understand the potential of regional landscape function and regeneration. Through their leadership, we can protect and rebuild our natural resources to ensure a thriving food system in the future. SS: Moving forward, we’d like to see more ingredients and products that reflect multiple metrics of food system success beyond the traditional goals of productivity and efficiency. For example, our hope is that more perennial, environmentally beneficial crops like Kernza® gain popularity and help shift and diversify our grocery paradigm. We’d also like to see more attention given to agricultural origins and place-based impacts on food products. With greater transparency on where and how food is grown, the better informed we can be when making food purchasing decisions. SS: Ultimately, the hope is to more closely link the ecological needs of the land with the dietary needs of consumers. Just like humans need to eat a variety of food groups and nutrients to stay healthy, the land needs a diversity of plants and animals to support ecosystem functioning. This shift will require a longer-term mindset that balances agricultural productivity with beneficial outcomes in soil health, biodiversity, and economic resilience in farming communities. SS: Our daily lives depend on thriving natural resources and biodiversity, and as a food company, we play a critical role to ensure this dependence is recognized and celebrated. We’re eager to play a role in advancing better farming systems that give heightened attention to the role of biodiversity – above and below ground – and to include everyone on the journey. 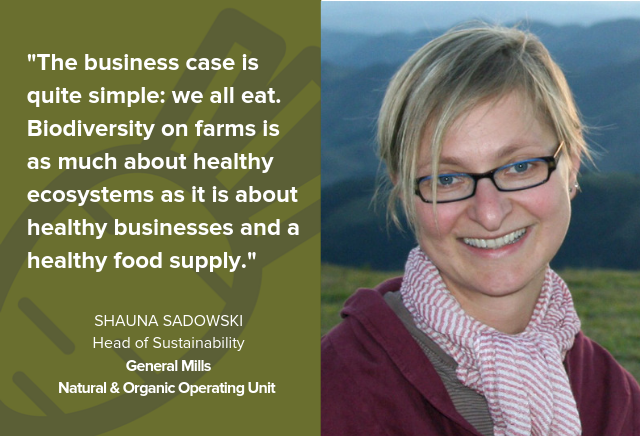 Shauna Sadowski is the Head of Sustainability for the Natural & Organic Operating Unit at General Mills. She is responsible for leading sustainability strategy, which includes integrating sustainability into the product design and supply chain, with an emphasis on food and farming programs, leading external partnership engagements, and ensuring sustainability is implemented across the brands. She works with her team to ensure transparency and accountability from farm to fork, leveraging the power of business to drive positive change in the food system. 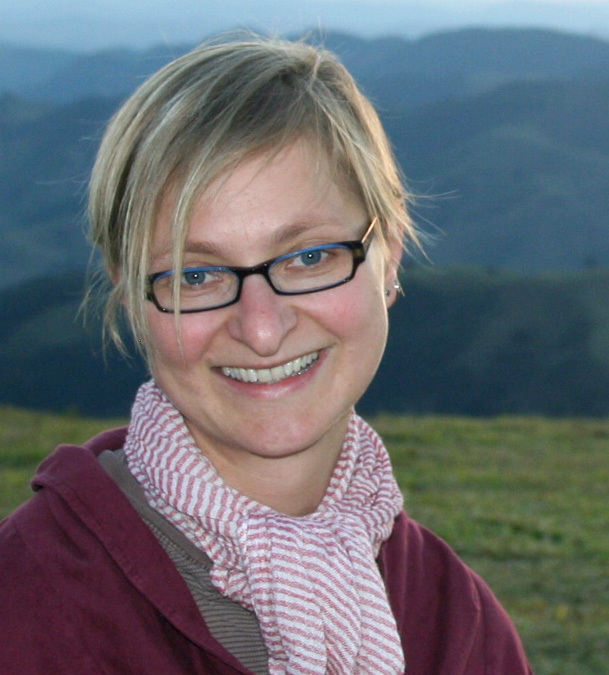 Prior to joining Annie’s in 2010, Shauna worked on sustainability management within the food sector at Clif Bar and Company, Fork in the Road Foods, and Business for Social Responsibility. Additionally, she has worked with a variety of industries through management consulting roles at the Corporate Executive Board and Arthur Andersen. Her commitment to sustainability stems from her early years of growing up on a farm in Saskatchewan, Canada. Shauna received her BS in Economics from the Wharton School at the University of Pennsylvania and a MS in Agriculture, Food and Environment from the Friedman School at Tufts University. She serves on the management board of the Climate Collaborative. Shauna lives in Berkeley with her husband, two children, and boisterous Boston Terrier.